We offer screen protectors for cell phones, digital cameras, gaming devices, and more. Our screen protectors for cell phones have become widely popular over the years and have been rated high for its toughness. Browse the categories to find screen protectors and skins for your device of choice. TechSkin is Skinomi’s latest solution in gadget and device protection. Developed from state-of-the-art film protection technology, TechSkin will keep your prized-possessions in perfect condition without adding the bulk of traditional cases. TechSkin is made from a clear, thermoplastic urethane film – the toughest of its class. It has the ability to resist the highest level of abrasion, making it the ultimate protection for gadgets and devices. The film’s “self healing” technology makes it immune to scratches and virtually indestructible. Passing numerous OEM tests in the United States, the TechSkin’s film has been hailed superior in scratch resistance to any other film on the market. TechSkin eliminates the need for bulky cases to protect your possessions from scratches and normal wear-and-tear. Traditional cases can hide your device manufacturers’ original sleek designs. The extra bulk can also make it feel awkward and prevent it from connecting to docks properly. 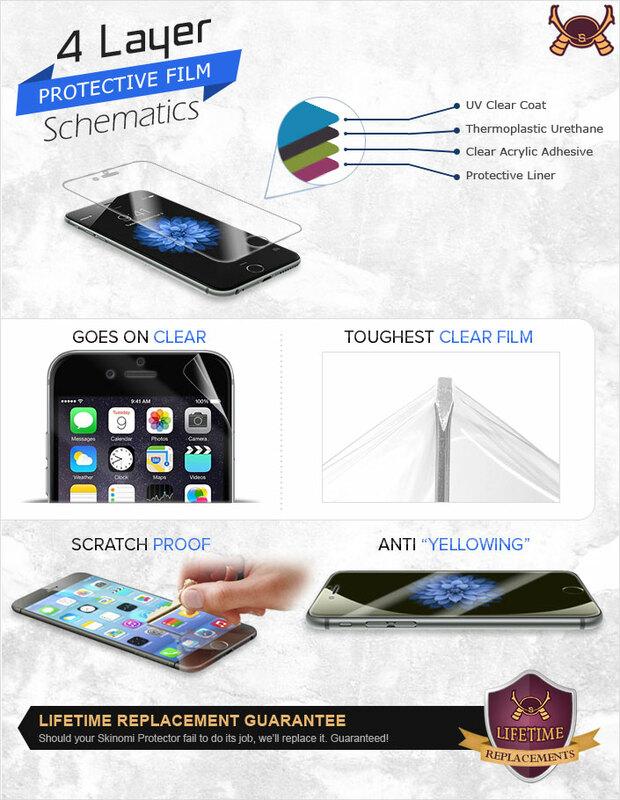 With TechSkin, you get full protection with the world's most durable transparent film! Our film material also contains a patented acrylic adhesive that separates us from the competition. Unlike other clear film protectors, our extra thin layer provides additional protection against lubricants, oils, UV rays, and corrosion. Some companies may try to sell you screen protectors that come in multiple packs of 5, 10, 15, 100...or whatever. This just says a lot about their protectors - it's disposable. With these protectors, you only have one shot for installation, and if you mess up, the screen protector is ruined. Most of these protectors are made from weak plastic that doesn't really offer real protection. They get scratched and the marks visibly stay on there, leaving your screen looking like it has scratches. Some crack, produce air-bubbles, or change clarity over time. TechSkin is the next generation of film protectors - made from the same material used to cover helicopter blades and NASA space shuttles. TechSkin offers true scratch protection. Just try scratching it with your keys. TechSkin's "self-healing" technology prevents scratch marks from staying on the film's surface, keeping its glossy and new look. Now that's real scratch protection! Got some lint caught underneath or improperly aligned the screen protector during installation? While other screen protectors become ruined because of this, TechSkin is removable, washable, and re-applicable during installation. TechSkin provides maximum scratch protection like no other. Do not confuse TechSkin with other screen protectors or knock-offs. There is only one TechSkin! • Grip-improving ridges assure smooth feel while making the device easier to grip and hold. • Easy to install film cuts that maximize coverage while minimizing customer's efforts. • The clear "Protection for Perfection." We are confident that TechSkin is the most durable clear film protector in the market. You only need to purchase a TechSkin once for the particular device you wish to protect. If your TechSkin ever gets damaged, we will replace it for as long as your device needs it.